But — not all parts of it are heating up at the same rate. Temperature in the Arctic in particular is rising faster than the global average. The Arctic, according to NASA data, warmed by about 2.2 °C (4 °F) between 1900 and 2015. Their estimate of Arctic heating is considerably bigger than NASA's. It indicates that between 1900 and 2015, Arctic temperature has risen about 2.9 °C (5.3 °F). Although more Arctic sea ice survived this year  than in the record-shattering melt of 2012, in 2014 the ice was nevertheless at its 6th-lowest level in thousands of years. About 70% of the sea ice in the Arctic has disappeared over the past three decades, mainly due to human-caused global warming. 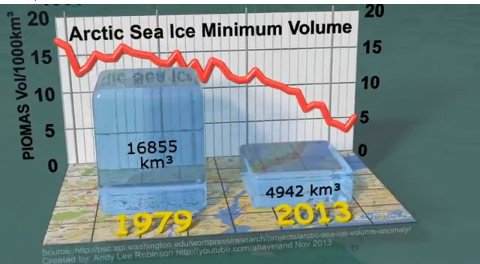 This rapid decline is well outside “the normal range” of Arctic sea ice extent and volume. Figure 2.29. Model simulations of Arctic sea ice extent for September (1900-2100) based on observed concentrations of heat-trapping gases and particles (through 2005) and four scenarios. Colored lines for RCP scenarios are model averages (CMIP5) and lighter shades of the line colors denote ranges among models for each scenario. Dotted gray line and gray shading denotes average and range of the historical simulations through 2005. The thick black line shows observed data for 1953-2012. These newer model (CMIP5) simulations project more rapid sea ice loss compared to the previous generation of models (CMIP3) under similar forcing scenarios, although the simulated September ice losses under all scenarios still lag the observed loss of the past decade. 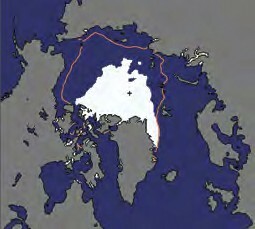 Extrapolation of the present observed trend suggests an essentially ice-free Arctic in summer before mid-century.139 The Arctic is considered essentially ice-free when the areal extent of ice is less than one million square kilometers. (Figure source: adapted from Stroeve et al. 2012136). 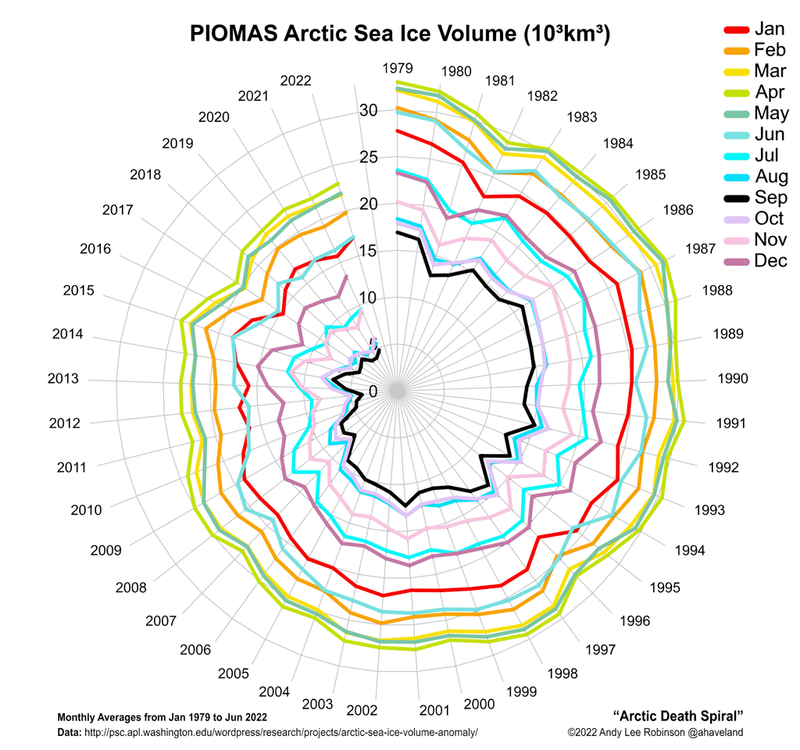 Artic sea ice volume has dropped far faster than coverage. In September the ice that remains is down by nearly 80% from its volume in 1980. 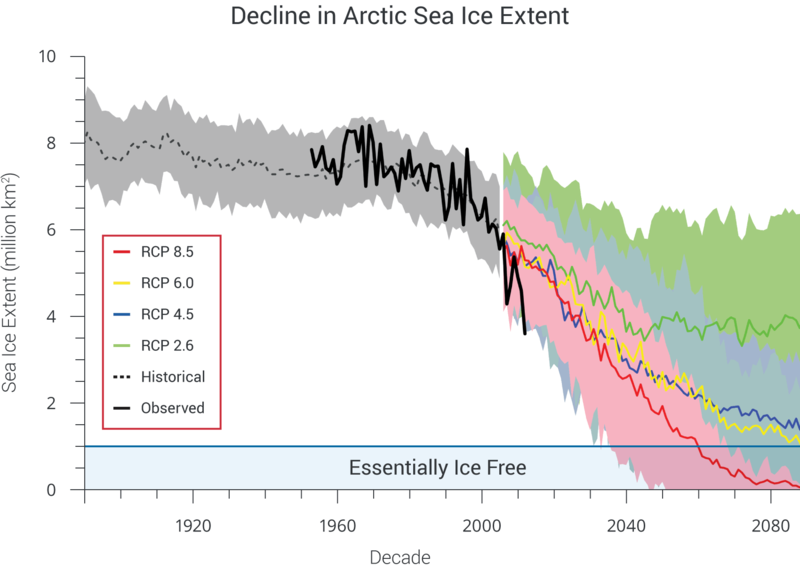 At current pace of volume loss, the first ice-free Arctic day could come in just a few years. 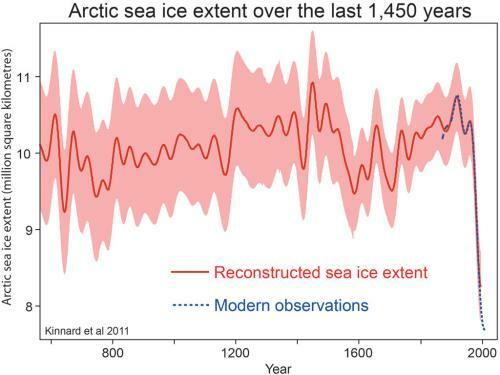 Reconstructed Arctic sea ice extent over the past 1,450 years, from Kinnard et al. (2011). Although more Arctic sea ice survived this year  than in the record-shattering melt of 2012, in 2014 the ice was nevertheless at its 6th-lowest level in thousands of years. About 70% of the sea ice in the Arctic has disappeared over the past three decades, mainly due to human-caused global warming. 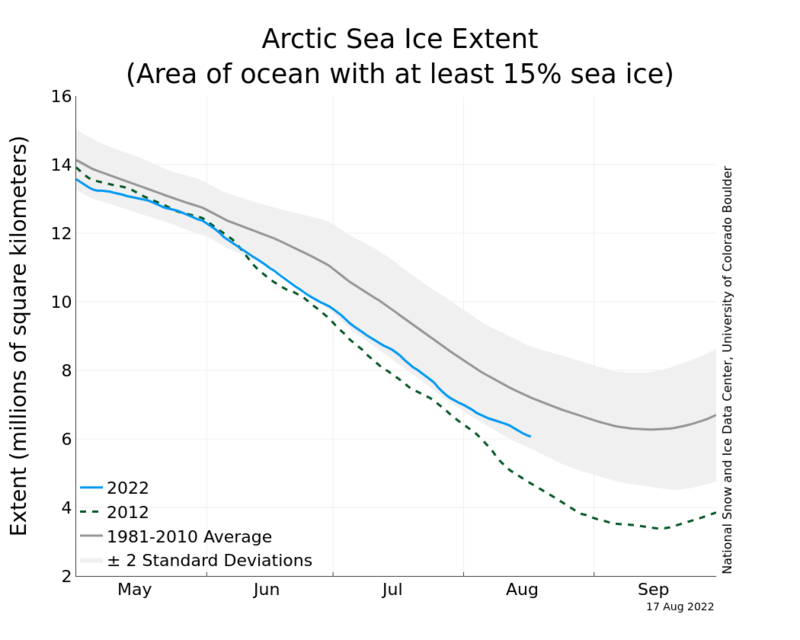 This rapid decline is well outside “the normal range” of Arctic sea ice extent and volume. The following excerpts from the biological sciences journal published by The Royal Society reinforce the vulnerability of the human species and go a long way to expose the crisis of our global civilization. But today, for the first time, humanity's global civilization—the worldwide, increasingly interconnected, highly technological society in which we all are to one degree or another, embedded—is threatened with collapse by an array of environmental problems. Humankind finds itself engaged in what Prince Charles described as ‘an act of suicide on a grand scale' , facing what the UK's Chief Scientific Advisor John Beddington called a ‘perfect storm' of environmental problems . The most serious of these problems show signs of rapidly escalating severity, especially climate disruption. 1 – Diamond J. 2005 Collapse: how societies choose to fail or succeed. New York, NY: Viking. 2 – Morris I. 2011 Why the west rules for now: the patterns of history, and what they reveal about the future. New York, NY: Picador. 3 – Montgomery DR. 2012 Dirt: the erosion of civilizations. Berkeley, CA: University of California Press. 4 – Brown J. 2012 Mankind must go green or die, says Prince Charles. The Independent (London). 5 – Sample I. 2009 World faces ‘perfect storm' of problems by 2030, chief scientist to warn. The Guardian. This post was previously published in Hacking at the Tree of Life. It has been editorialize for re-posting in BoomerWarrior.